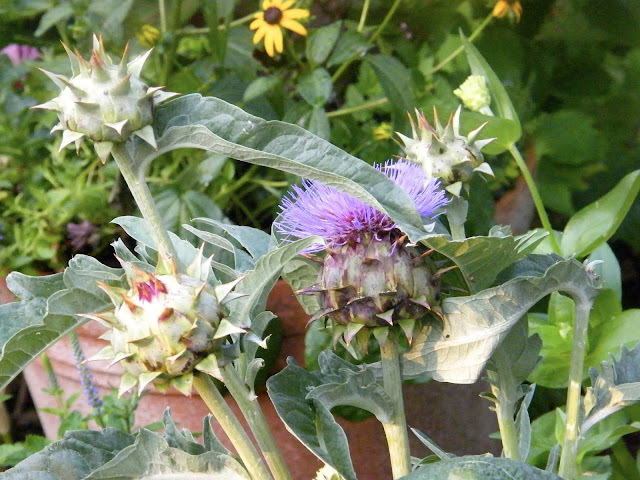 "Disruption and mayhem in the garden often force change and encourage new and deeper roots. True for the gardener as well as the garden". It is so tiresome for me to once again kvetch about the havoc that AT&T (and now Apple) has wrought on my blog life...especially since I am always whining and complaining about it. Still, it is amazing how much disruption getting a simple new router can cause and how much downtime on the computer is a result. In the void, however, I have been trying to up my game on Instagram...providing followers with mini garden design tips each day, with photographic examples of each, mostly from my own garden. A fun learning process for me, and hopefully valuable for you. If you too would like to get a daily dose of design (I do LOVE alliteration), please follow me on Instagram by going here. I would love to hear your thoughts and comments. And do please share if you feel it might be valuable to someone else. On another note, I was working out front in the garden today and a young couple strolled by asking questions about my turf and landscape. They had just bought a house nearby and were 'starting from scratch' so to speak. I told them I had recently written an article in SOUTHERN LIVING Magazine in June about that very topic and was about to repost the article on my blog. So, if you missed it the first time round, or are in need of some small garden inspiration, maybe you will find this re-post helpful. 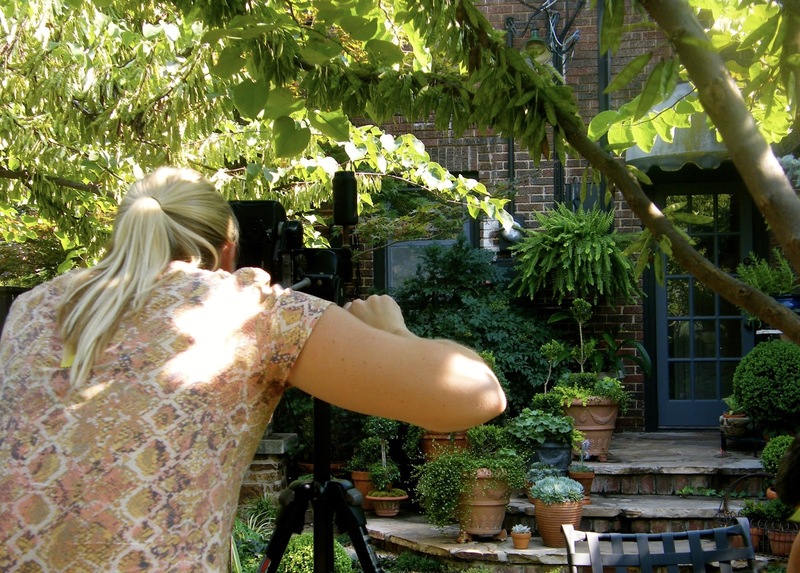 The potager as it looked the week of the SOUTHERN LIVING shoot. I found myself referring to points in the article I wrote for the June 2016 issue of SOUTHERN LIVING over and over again as it addressed this very topic. In case you didn't see the article (it will probably remain on newsstands for a couple more days), here are some of the points I made. Maybe it will help you put the pieces of your own garden puzzle together as you create a space that is uniquely yours. 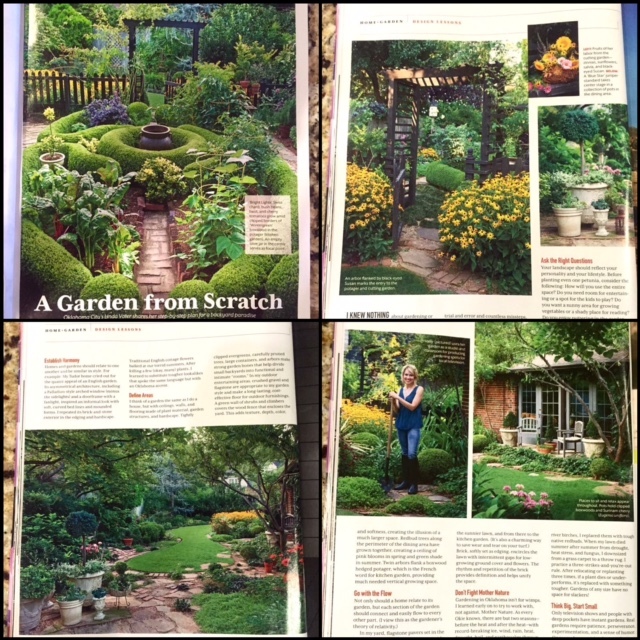 (For other tips on gardening in the South, consult SOUTHERN LIVING'S The Grumpy Gardener here, on the blog The Daily South. 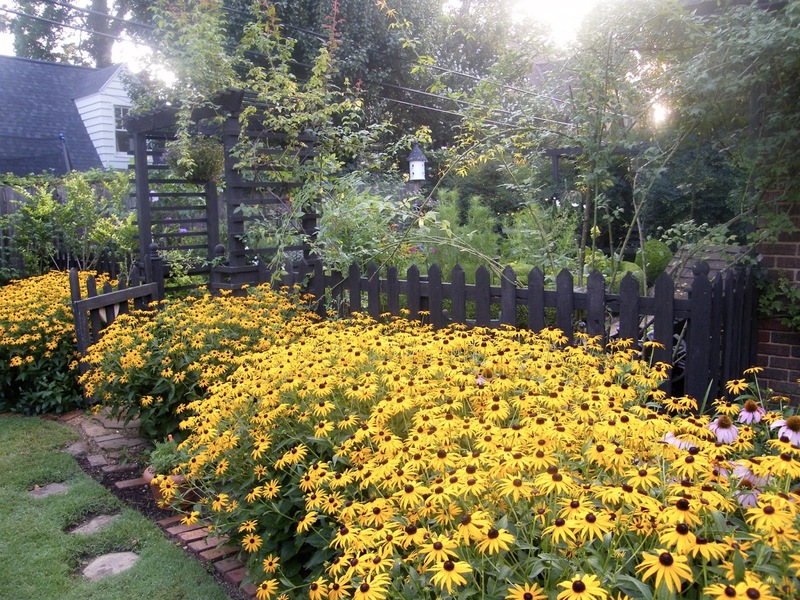 Large masses of 'Goldsturm' Rudbeckia make a strong statement in my small garden. Time to divide and share, me thinks! When we moved into our 1935 Tudor home twenty-five years ago, I knew nothing about gardening or garden design. The small back yard contained exactly one gnarly old tree , a nest of blackberry brambles and an abandoned sandbox. Crumbling concrete steps led to a ‘lawn’ of weedy, hardpan clay. But after MUCH trial and error, hard work, and a LOT of missteps, the pieces finally fell into place. Now it’s a beautiful and much-used extension of our home. 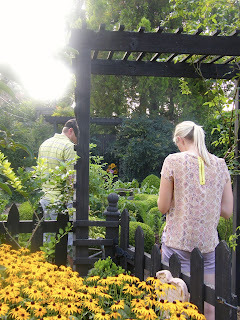 Here are some garden design lessons I learned along the way. Photographer Ryan Ford (see her work here) sets up shots in back yard. 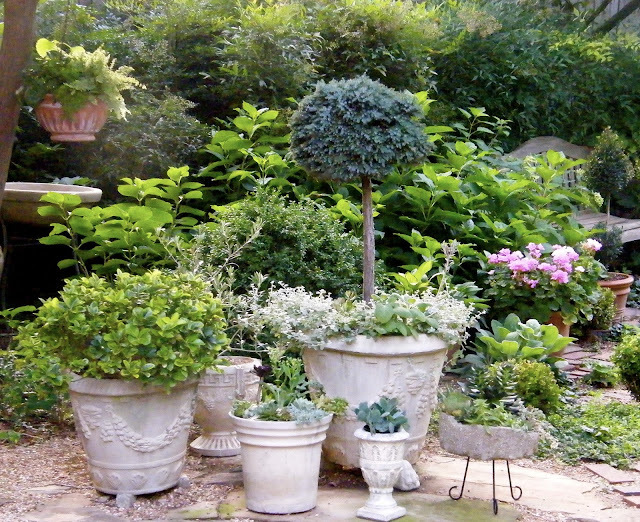 Your landscape should reflect your personality and the way you and your family live. Before planting even one petunia, ask some questions. Do you need a space for entertaining or a kids’ jungle gym? A sunny spot to grow vegetables or a shady spot to read? 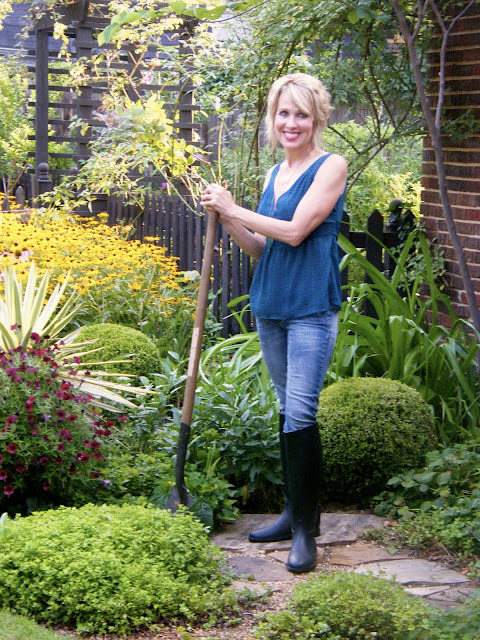 Do you enjoy puttering in the garden or strictly low to no maintenance? Are you traveling all summer and home in spring and fall? Questions like these help decide what is important, where to put what, and how to get what you want from a limited amount of space. 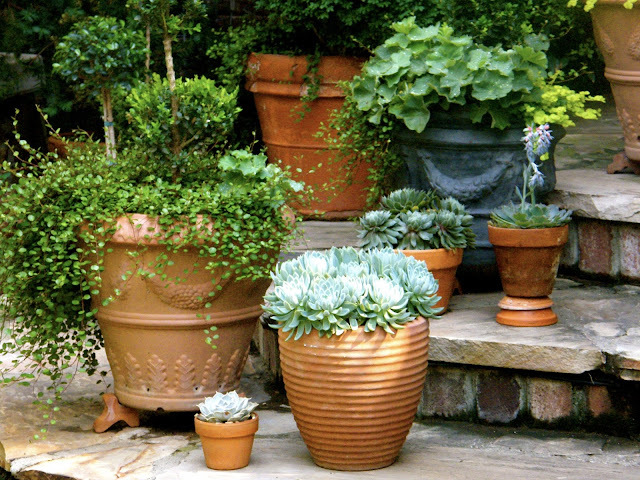 Home and garden should relate to one another and be similar in style. For example: my Tudor home cried out for the quaint appeal of an English garden. Its asymmetrical architecture with rounded window and door frames inspired an informal style with soft, curved bed lines and mounded forms. I repeated its brick and stone exterior in the edging and hardscape. Traditional English cottage flowers balked at our torrid summers. After killing a lot; okay, A LOT of plants, I learned to substitute tougher look-a-likes that spoke the same language but with an Oklahoma accent. 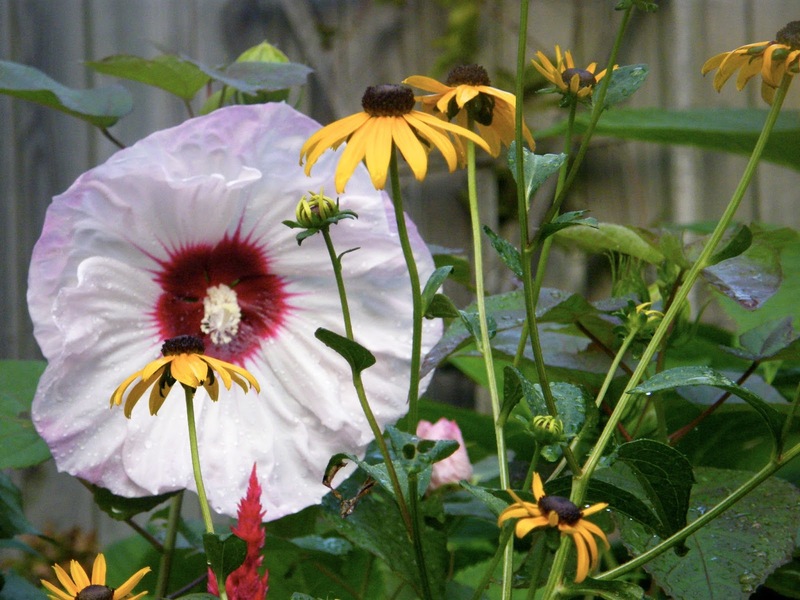 PW Hibiscus 'Cherry Cheesecake" and rudbeckia. 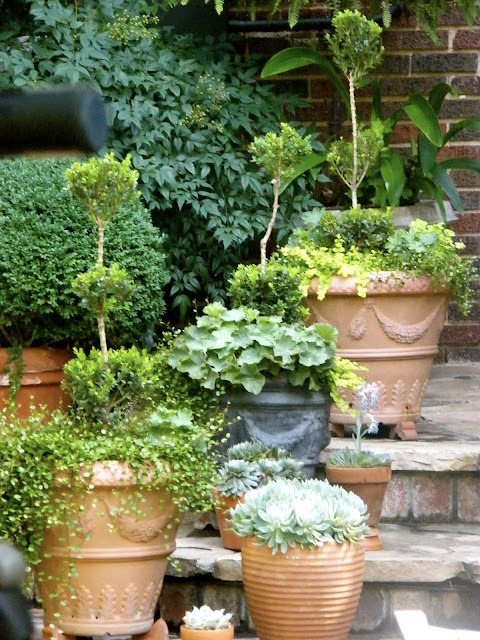 A group of container plantings creates a sense of enclosure in the dining area. cost effective floor for outdoor furnishings. A green wall of shrubs and climbers covers the wood fence that encloses the yard. This adds texture, depth, color and softness, creating the illusion of a much larger space. Redbud trees surrounding the perimeter of the dining area have grown together, creating a ceiling of pink blooms in spring and green shade in summer. Twin arbors flank a boxwood hedged potager, enclosing a kitchen garden and providing much needed vertical growing space. Arching branches of redbud trees create a living ceiling over the dining area. 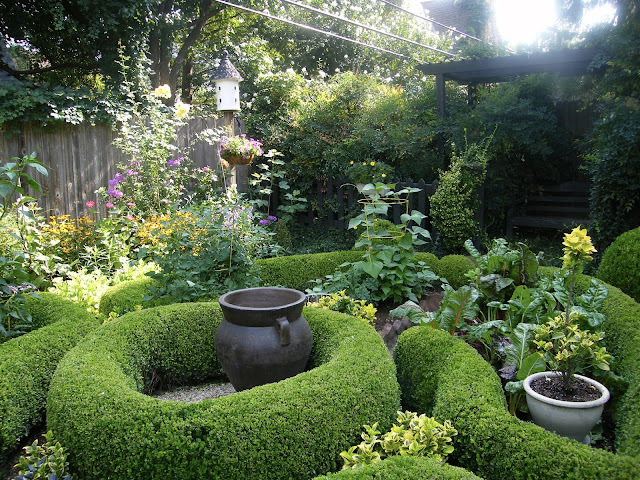 Not only should a home relate to its garden, but each section of the garden should relate, connect, and easily flow to every other part. (I think of it as the Gardener’s Theory of Relativity). 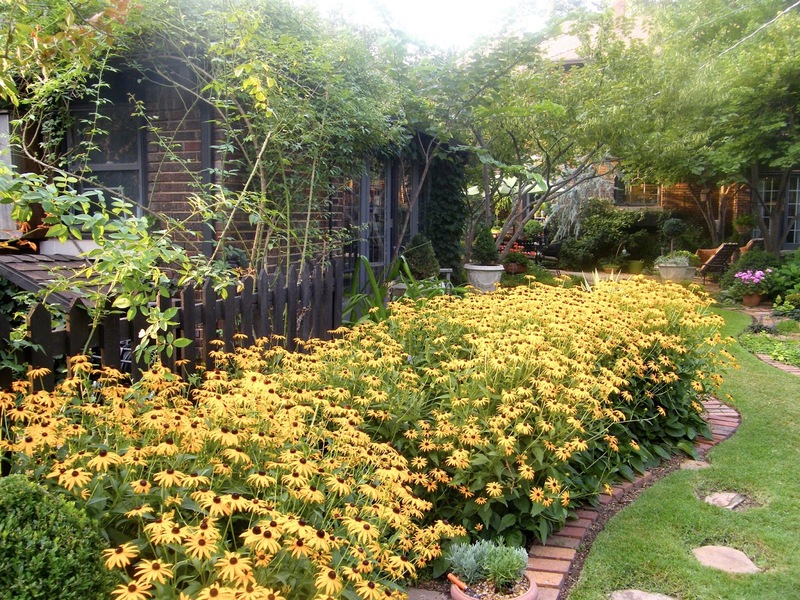 Goldsturm Rudbeckia in huge swaths makes a dramatic statement in a small garden. Brick, soft-set as edging, encircles the lawn with intermittent gaps for low growing ground cover and flowers. Their rhythm and repetition provides definition and helps to unify the space. Terracotta pots march up and down the back steps creating rhythm and repetition. Gardening in Oklahoma ain’t for sissies. I learned early on to try and work WITH, not against, Mother Nature. As every Okie knows, there are but two seasons…before the heat and after the heat…with record-breaking ice, cold, wind, rain, heat, drought, hail and earthquakes thrown in to keep it interesting. Consequently, when back to back ice storms felled three river birches, I replaced them with tough,native redbuds. When my grass reliably died each summer from drought, heat stress and fungal issues, I downsized my grass carpet into a throw rug. I practice a three strikes and you’re out rule. After relocating or replanting three times, if a plant dies or underperforms, out it goes with something tougher in its place. Gardens of ANY size have no space for slackers! 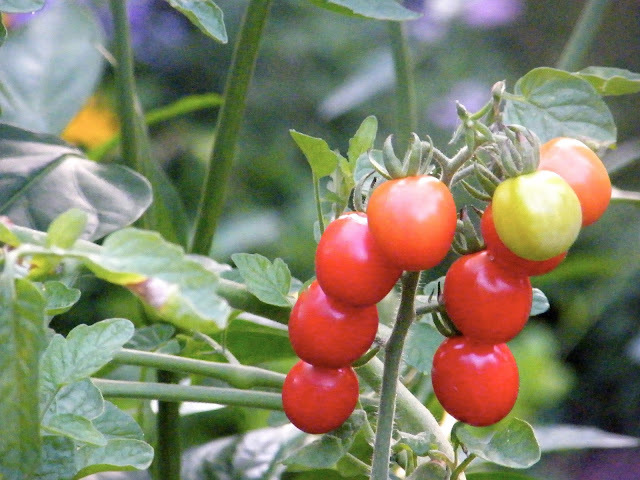 The area to grow edibles in the potager is small. 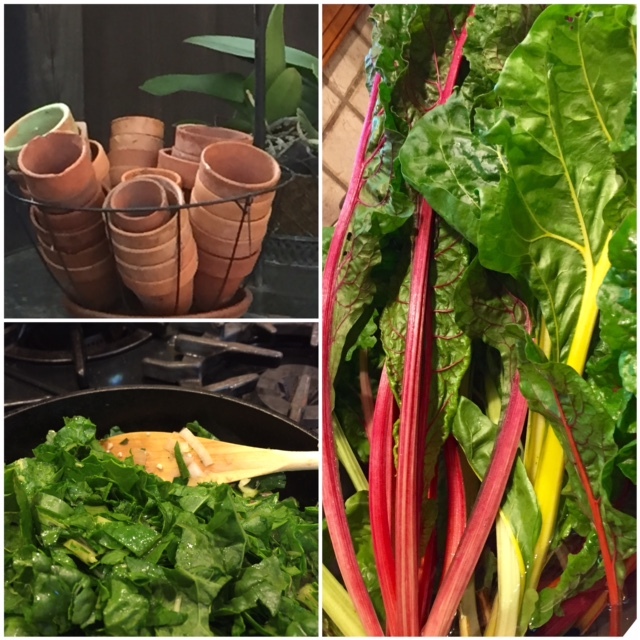 I try to only grow those things we will actually consume! it. THEN move on to the next area. Eat that elephant one bite at a time. 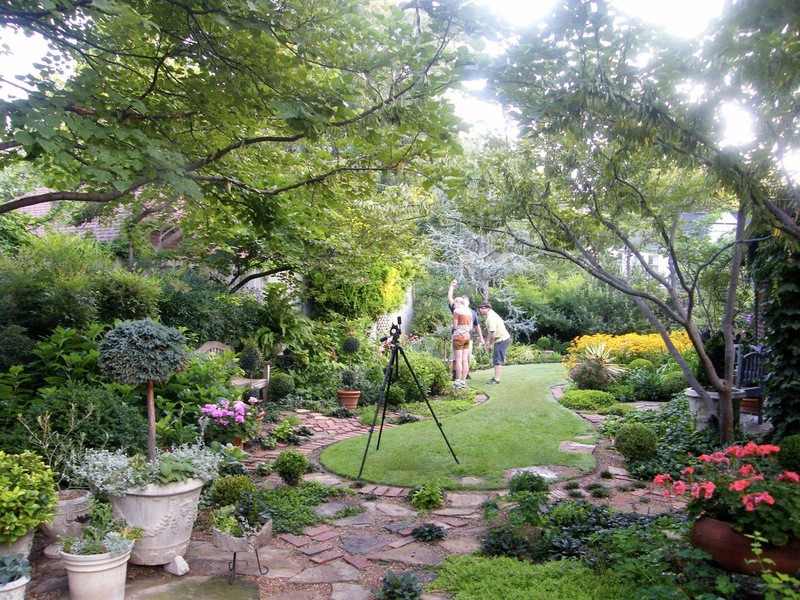 DO remember that what you want from your yard will change over time, so be flexible in your design. Most of all, enjoy the creative process as well as the end result. 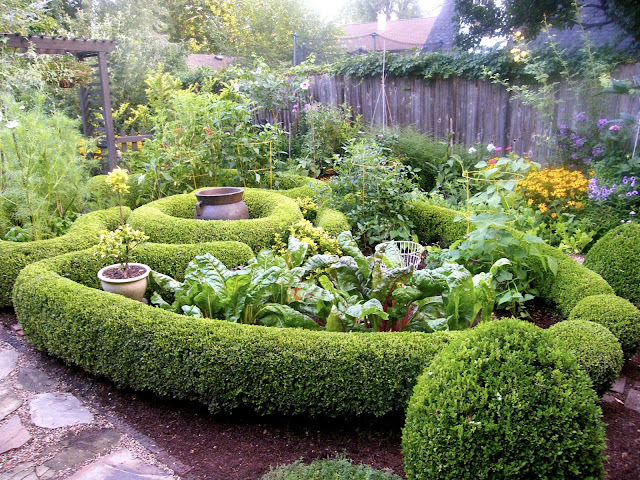 After all, a dream garden is much more than just the sum of its parts. 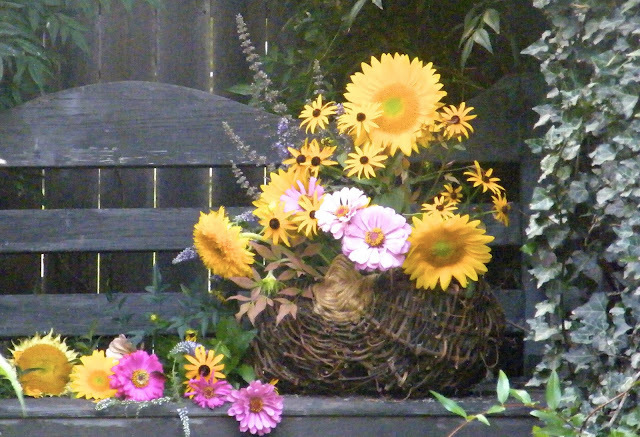 Cheery blooms of sunflowers, zinnias, veronica and rudbeckia create a still life on the potager bench for the SOUTHERN LIVING shoot.